For several months now I have been working on this one piece of art. It is a dress collection that I created using a fashion book. 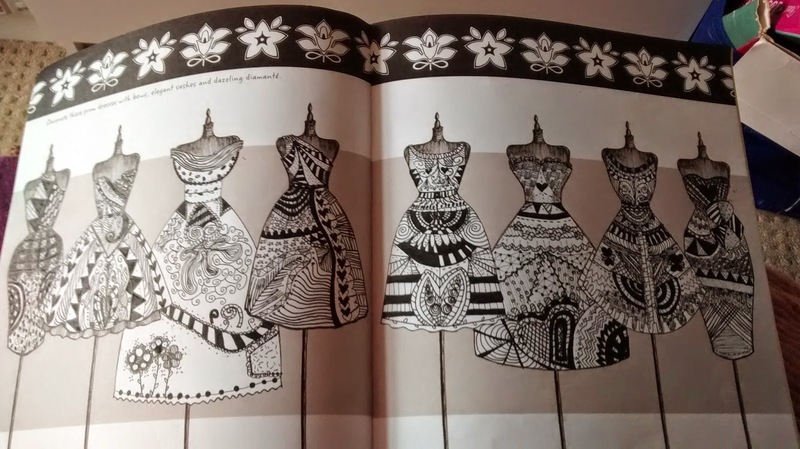 The page I used had simple templates of dresses that had noting on them, the brief was to make them into prom dresses but I kind of ignored that bit, instead I created zentangle style dresses. Zentangle is a form of drawing. It was first created in India by a man and his wife who relaxed regularly (i.e meditation etc.). As you can tell by the name it is a form of zen (a japanese word for meditation) so it is meant to be relaxing to complete. The second part of the word 'tangle' is like doodling which is exactly what you do in zentangle-very detailed and intricate doodles! As I said before, it's supposed to be a calming and relaxing art form similar to meditation but a bit different, however I didn't really see it like that, it may of been relaxing, yes, but I just used it as a way to draw if you see what I mean. I used black fineliners of different sizes to create my collection. Take a look below at the picture (click on it to see it full size)! I hope you like it! Beautiful designs, keep up the good work!